DRDO is recruiting fresher BE/ btech individuals who have completed their engineering degree to apply for the post of Junior Research Fellow. Educational Qualification Needed: For being eligible to apply for this job, the candidates are required to have completed their education in any one of the following degree. Posted in Civil, Computer Science, Freshers, Government Job. Tags: August 2011, DEFENCE RESEARCH AND DEVELOPMENT ORGANISATION, DRDO hiring Engineering graduates, DRDO job for BE/ BTECH on August 20, 2011 by Neeraj. 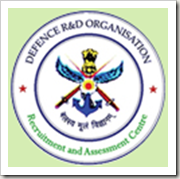 DRDO Defence Research and Development Organisation | Walk-ins BE/ BTECH (Metallurgy) | Govt. Jobs | Date: 27 June, 2011. BE/BTECH (Metallurgy) required in Defence Research and Development Organisation, Hyderabad. Important: DEFENCE METALLURGICAL RESEARCH LABORATORY (DMRL) is situated about 15 Kms from Secunderabad Railway Station and 10 Kms from Hyderabad Railway Station. Bus Nos. 102 from Secunderabad to Labs Qtrs, 102 from Public Gardens (Near Hyderabad Railway Station) to Midhani/Keshavagiri, 102A, 102B, 203, 251M, 102M & 102P from Koti Womens College to different places ply via DMRL X Roads (alighting point) at frequent intervals. Education: 1st Class BE/ BTECH (Metallurgy) from a recognized University. Posted in Government Job, Job After Btech, Metallurgical, Walkins. Tags: 2011., BE/ Btech, Date: 27 June, DEFENCE RESEARCH AND DEVELOPMENT ORGANISATION, DRDO, Govt. jobs, Metallurgy, Walk-ins on May 11, 2011 by kavita joshi. Posted in All Branches, Chemical, Civil, Computer Science, Electrical, Electrical & Power, Electrical and Electronics, Electronics and Communication, Electronics and Instrumentation, Electronics and Telecommunication, Government Job, IT, Job After Btech, ME, Mtech, Naval Architects, Production, With experience. Tags: Apply online, April 2010., BE, btech, DEFENCE RESEARCH AND DEVELOPMENT ORGANISATION, DRDO, Government Jobs, ME, Mtech, Recruiting on April 26, 2010 by kavita joshi.